In the Powis collection of documents at the Shropshire Archives there is land survey of 1824 carried out for the Earl of Powis by Charles Mickelburgh of Montgomery in which there is a very clear reference to Brineddin Wood. On the south side [of] Brineddin Hill in this township there are between 20 or 30 acres of Fine Oak Brush which is cut by the Freeholders each knowing his share by Mere stones at the bottom adjoining the Hedge, but the top is open to the Common, and C.M. believes this to be a part of it. The Cottages cut it, altho’ the Freeholders grumble, but mostly towards the top part; there is a small Track near the top which the Freeholders wish the Cottagers to observe as their boundary, but little attention is paid to it, as the Brush grows much better nearer the bottom where they are tempted generally to go. The Mere Stones are of a recent date being put up about 17…. [left blank!]. If this land was coppiced up it would soon be covered with fine young oak. What a shame it doesn’t give the date that the mere stones were installed as this could have been a clue to when the main body of the wood was divided up. 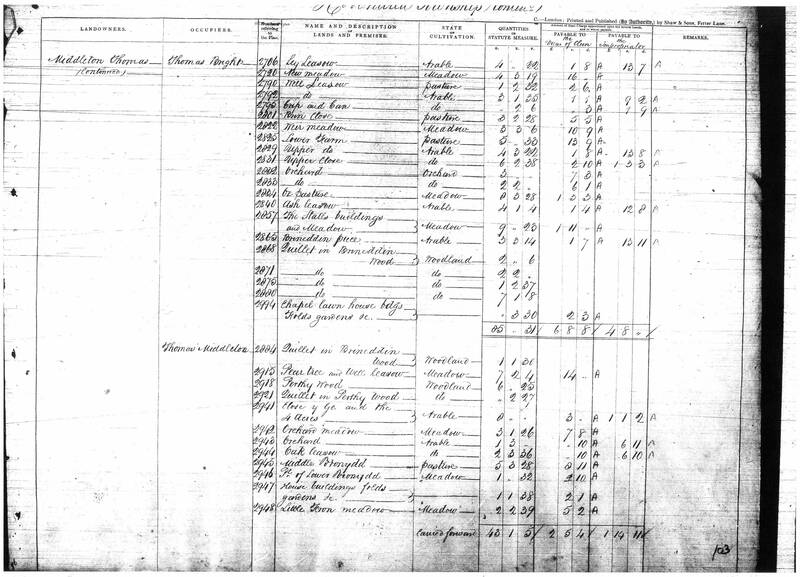 By searching through the Tithe Commutation Survey of 1848 one can identify the ownership of all the quillets at that time . 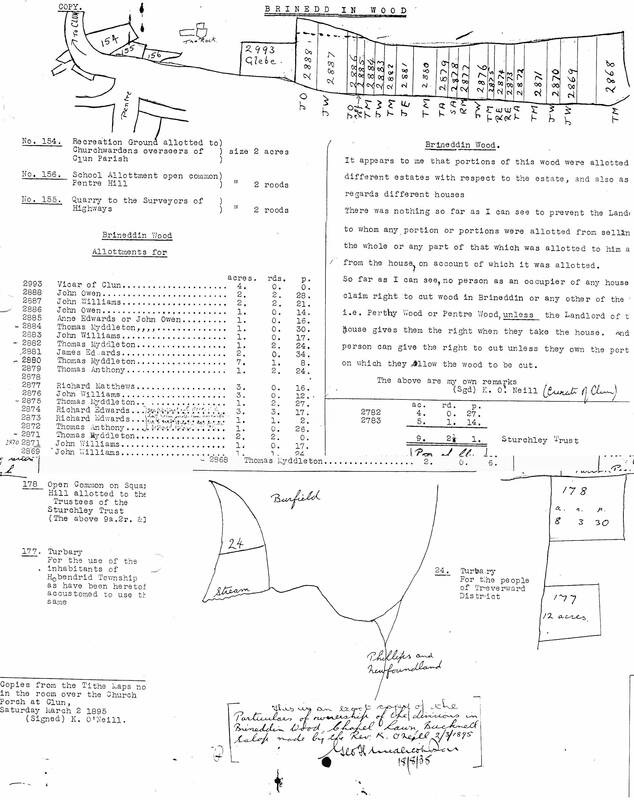 The example below shows that Thomas Middleton (of Llynaven Farm) owned quillet no 2884 (click to enlarge). A number of lists exits showing the changing ownership throughout the 19th and 20th Centuries such as this one drawn up in 1895 by Rev A.K O’Neil, the curate from Clun Church who was attached to St Mary’s Church in Chapel Lawn (click to enlarge). Mr Picken was the village postmaster at Bucknell at the beginning of the 20th Century. He was also a keen photographer and produced a range of postcards of Bucknell and the surrounding area. 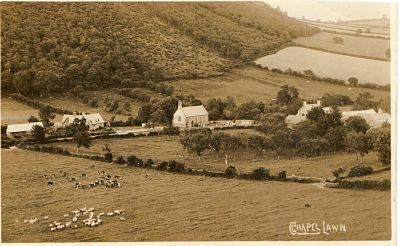 There is a very good photograph from the Picken Collection of Chapel Lawn viewed from Caer Caradoc which shows clear felling of at least two quillets – probably 2869 and 2870, then in possession of the Adams family at the Smithy. The picture isn’t dated, but is almost certainly Edwardian and may have been for the supply of timber for war effort. 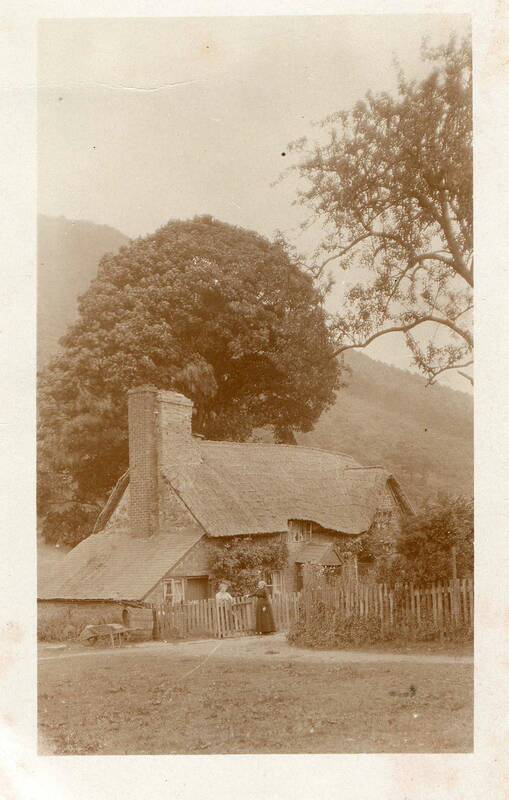 In another picture by Mr Picken, maybe even taken on the same day, it’s just possible to make out the felled portion of the wood in the behind the cottage that what was then known as Camp View, but has since been renamed Caractacus (note: the thatch has now been superseded by solar panels!). Herbert Robinson lived and worked there at the time as the village carpenter and wheelwright. If the woman standing behind the picket fence is Herbert Robinson’s wife, Ellen, it dates the photo to be no later than 1903 as Mrs Robinson died in that year aged 47. Mr Robinson owned quillet no 2881 so may have used it as a convenient source of timber, maybe until close to his death in 1944.